The rough, rudimentary, and raw characteristics of the brand allows G-Star to maintain its distinct and unorthodox style.... Futuristic and cautious. Far-reaching and experimental. Alternative and traditional. 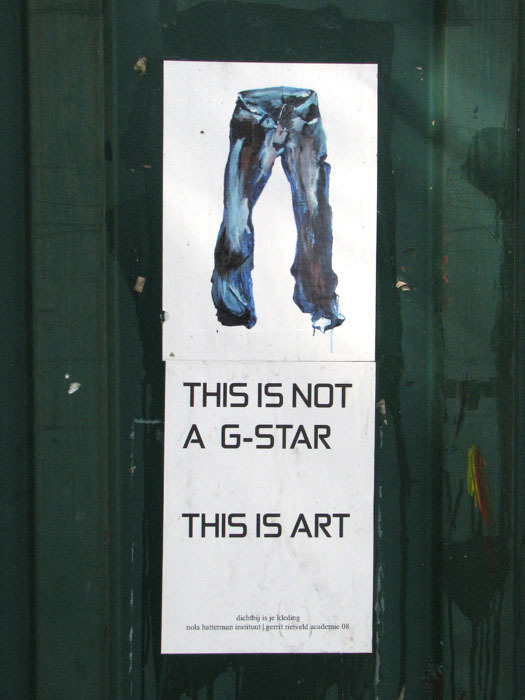 G-Star is about making eccentric combinations, and maintaining authenticity. -- From the G-Star website. G-Star RAW is a Dutch clothing brand whose "urban" style, often influenced by military apparel, is popular with young people in Western Europe--and in Suriname, where their boldly branded jeans, jackets, and t-shirts are a fixture in boutique windows along Domineestraat and other major shopping thoroughfares, competing for space with North American labels like Levis and inexpensive clothing imported from Brazil. The brand doesn't seem to have caught on yet in the Anglophone Caribbean, and I'd never heard of G-Star until I noticed the poster above, pasted on a outdoor wall, in Paramaribo last April. I would have taken it for an advertisement, were it not for the location, just outside the Nola Hatterman Art Academy. A closer look revealed a caption suggesting this was an artist's project, but no name. Later I found out the poster was the work of Shaudell Horton, a student at Nola Hatterman, who made the piece during a 2008 workshop with a visiting instructor from the Gerrit Rietveld Academy in Amsterdam. Visiting Paramaribo again in June, I thought of this poster one mid-morning when I ducked into a trendy downtown clothing shop to escape a sudden downpour. The women's section downstairs was packed with smartly dressed teenage shoppers. Upstairs was less hectic. As I browsed the racks, waiting for the rain to stop, I noticed a display of t-shirts with a distinctive graphic style. 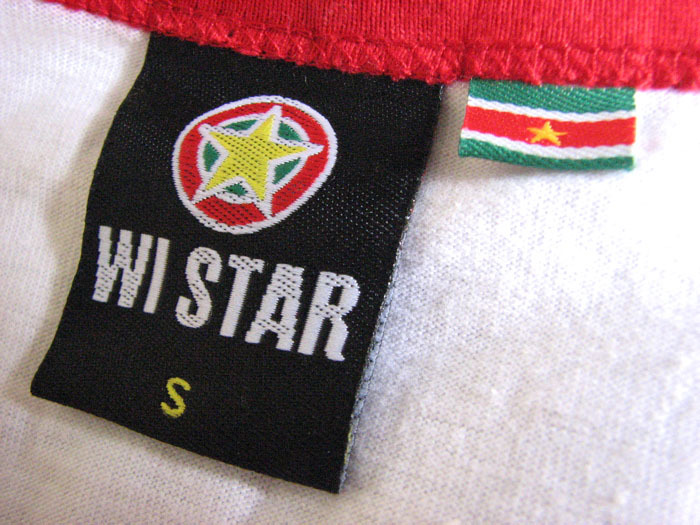 In varying combinations of red, green, yellow, black, and white--Suriname's national colours--they were boldly branded "WI STAR", in blocky text with the star-in-a-circle icon from the national flag. 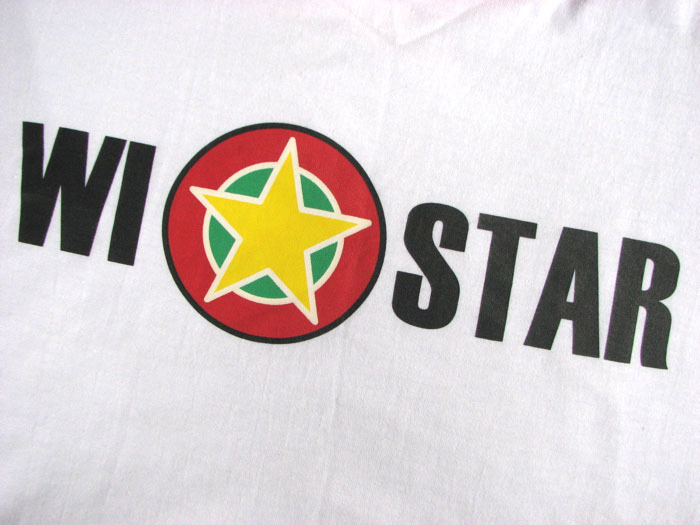 Like Horton's poster, these t-shirts cheekily--and stylishly--comment not only on the shopping preferences of young Surinamese, but also on the notion of clothing and fashion as a badge of social identity--individual, communal, national, transnational. WI STAR means, of course, "our star" (perhaps with a hint of "we are stars"? ), but to my Antillean eyes "WI" also suggests "West Indies", and the t-shirts are one more piece of evidence, conscious or otherwise, of Suriname's links to the Caribbean. Needless to say, I bought one.